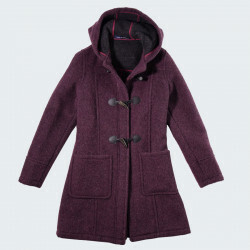 Duffle-coat elegant and feminine in aubergine colour. This aubergine duffle-coat is elegant and feminine, it will fit perfectly with your outfits. Inside, the tartan lining of the coat and hood perfectly balances with the aubergine colour for a modern touch. The finishes are of very good quality: leather fasteners, genuine horn buttons, double-sided sheet, inside pocket, 2 outside patch pockets on the front. The cut is feminine and slightly flared. The London Tradition duffle-coats combine modern design with traditional craftsmanship and first quality material for premium, stylish comfortable garments. The London Tradition clothing factory is located in London, in the heart of the UK capital. London Tradition was created in 2001 in East London by two partners, Rob Huson and Mamun Chowdhury, both with more than 25 years of experience in the garment business. Their aim was to build up a brand renowned for its products, synonymous with quality, value and elegant style. In 2014, the company has been rewarded with the prestigious “Queen’s Award for Enterprise 2014 for International Trade”. London Tradition supplies today the most renowned and demanding distributors worldwide. London Tradition has always been striving for the best quality owing it all of its customer fidelity. Today, London tradition duffle-coats are worn by the young and old alike, as well as urban or country wear, as London Tradition became a famous, iconic brand with a clear focus on exceptional quality craftsmanship and luxury garments. All London Tradition duffle-coats are made in England, with expert knowledge of English outerwear. The innovative double face wool has been sourced from the most renowned suppliers and gives the garment its worldwide appreciated authentic look. The London Tradition duffle coat finish makes it robust and a great protection against wind and rain. Real leather straps, horn brandenburgs, great attention to details and seams complete the iconic duffle. Each coat is cut and handcrafted, and boasts London Tradition’s exceptional skills, precision and knowledge of heritage craftsmanship. Mamun Chowdhury, co-founder and Company CEO explains: “We conceive and make coats for customers from Tuscany to Tokyo. 90% of our clientele is out of the United Kingdom. We offer them a piece of the British culture with international style. Our “Made in Britain” manufacturing warranty is at the heart of our success”.